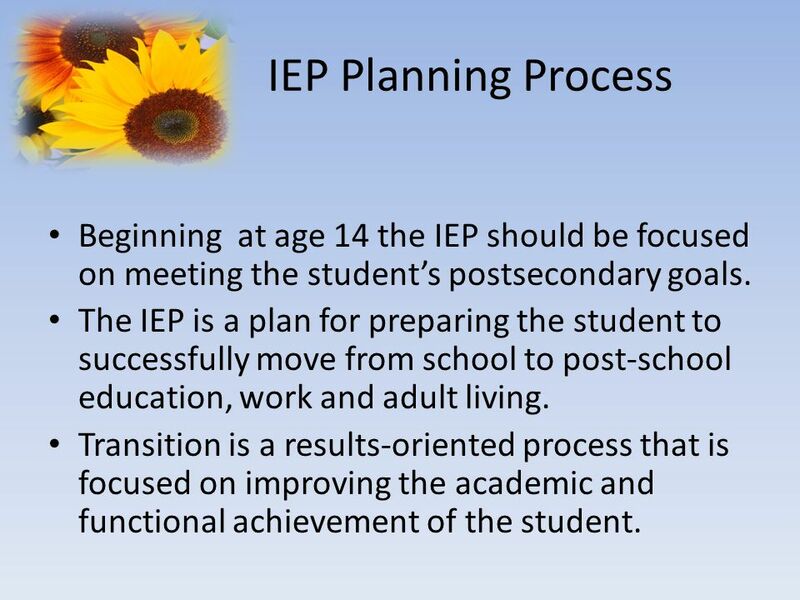 2 IEP Planning Process Beginning at age 14 the IEP should be focused on meeting the student’s postsecondary goals. The IEP is a plan for preparing the student to successfully move from school to post-school education, work and adult living. Transition is a results-oriented process that is focused on improving the academic and functional achievement of the student. 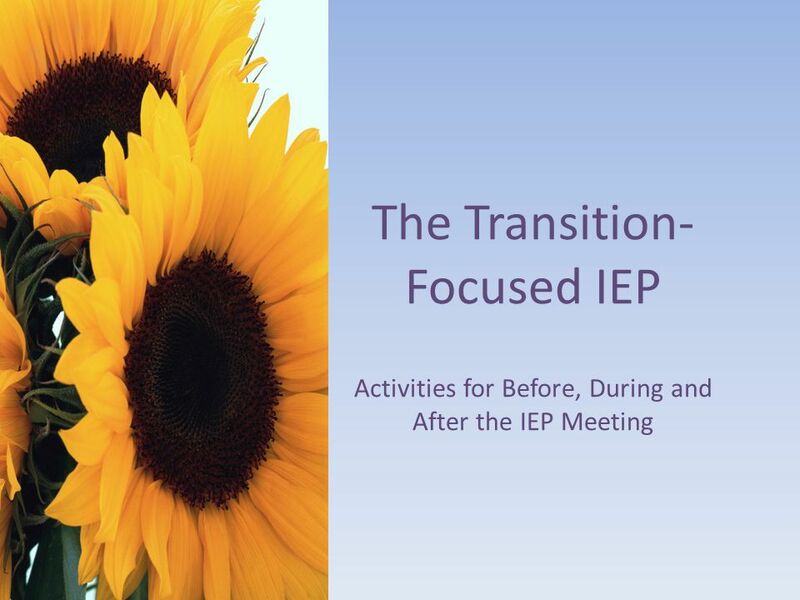 The purpose of this document is to increase the understanding of exactly “what” must be done, as well as to provide a clear understanding of “how” transition planning can be accomplished through the IEP process. Kansas requires that IEPs for students age 14 and older begin the process of planning for the student to transition from high school to post-school education, work and adult living. By age 16 the IEP is to include a coordinated set of services designed to move students with disabilities successfully from school to post-school settings. The transition IEP process is intended to result in a comprehensive, coordinated plan of activities to be implemented during the term of the IEP. The plan should reflect the IEP team’s response to the student’s postsecondary goals beyond one year and beyond just preparing the student for graduation. 3 Transition Process AGE APPROPRIATE TRANSITION ASSESSMENT: Beginning at age 14, conduct age appropriate transition assessment related to training, education, employment, and , where appropriate, independent living skills. MEASURABLE POSTSECONDARY GOALS: Beginning at age 14, develop postsecondary goals in the areas of education/training, employment, and if appropriate, independent living skills. PRESENT LEVELS OF ACADEMIC ACHIEVEMENT AND FUNCTIONAL PERFORMANCE: Instruction, related services, community, employment , daily living skills, adult living objectives, functional vocational evaluation. 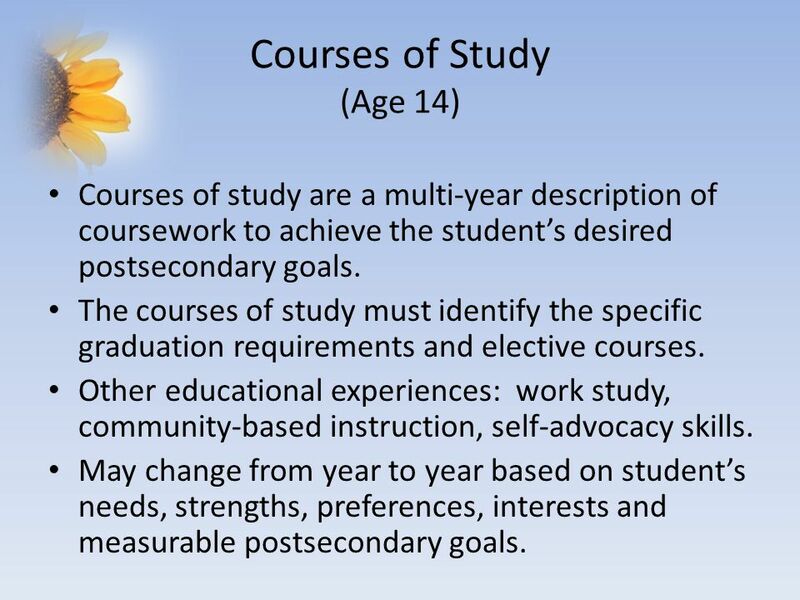 COURSES OF STUDY: Beginning at age 14, and reviewed annually, identify the courses of study needed to assist the student in reaching his/her measurable postsecondary goals. TRANSITION SERVICES: Beginning at age 16, or younger if appropriate, identify transition services in the areas of instruction, related services, community experiences, employment, other post-school adult living objectives, and if appropriate, acquisition of daily living skills and a functional vocational evaluation. 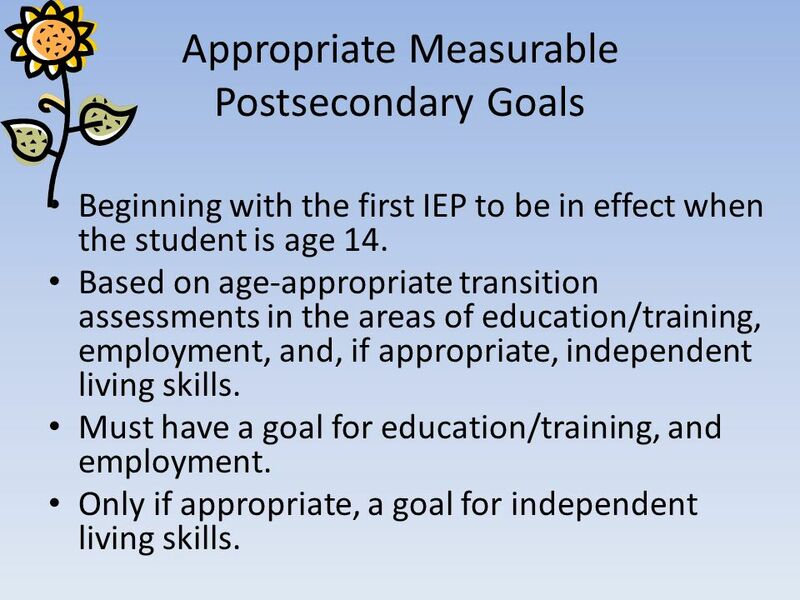 MEASURABLE ANNUAL IEP GOALS: Develop annual IEP goals which support the student to meet his/her postsecondary goals. SUMMARY OF PERFORMANCE: Upon graduation or age 21, provide a summary of the student’s academic achievement and functional performance, and recommendations to assist the student in meeting his/her postsecondary goals. This is a flow chart of the Transition Process. We will cover all areas in the Transition-Focused IEP. 4 Before the IEP Meeting Prior to age 14 conduct an age-appropriate transition assessment related to training/ education, employment, and, where appropriate, independent living skills. The assessment will assist in developing the measurable postsecondary goals. The assessment will assist in identifying transition services needed to reach the goals. Transition assessment should be on-going. 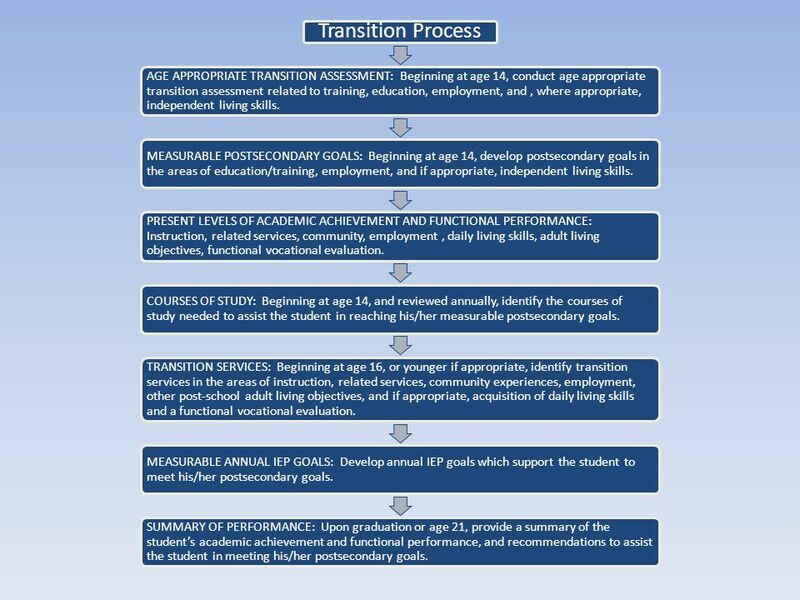 The purpose of transition assessment is to provide information to develop and write practical, achievable measurable postsecondary goals and assist in the identification of transition services necessary in helping the student reach those goals. 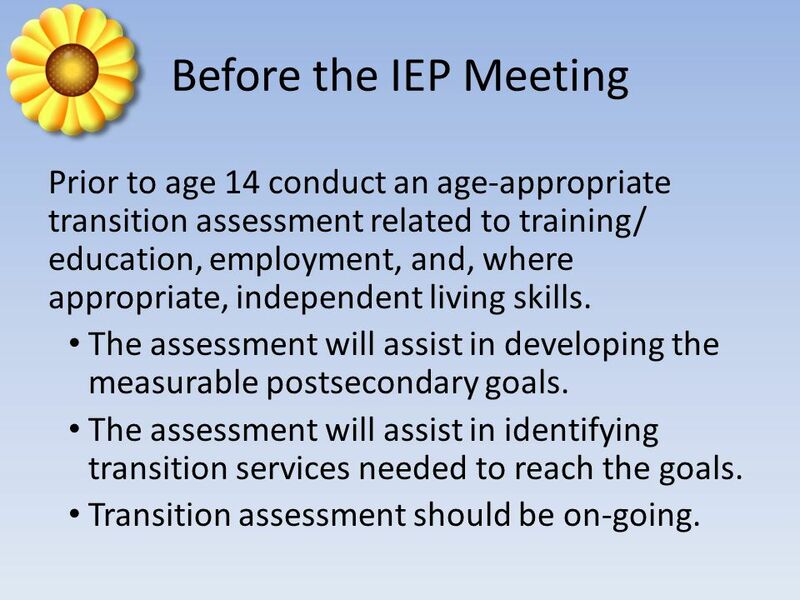 The first transition assessment must be conducted prior to the student reaching age 14 and prior to the development of the measurable postsecondary goals and transition services in the students IEP. For each of the postsecondary goal areas addressed in the student’s IEP there are to be age-appropriate transition assessment information provided on the student’s needs, taking into account the student’s strengths, preferences, and interests regarding each postsecondary goal. The assessment information can be documented either in the IEP or in the student’s file. 5 Assist the student and family to determine needs, strengths, preferences and interests related to life after high school. Conduct career awareness exploration activities and a variety of formal and informal assessments. Explore opportunities within general education for the student to participate such as the development of Personal Plans of Study and Kansas Career Clusters. Integrate these processes into the transition planning for the student. Explore opportunities within general education for the student to participate in career exploration and planning such as, the development of a personal plan of study (PPS). The PPS is a process of examining self-interest and aptitudes, setting goals, and laying out a plan that will lead toward those goals that will serve students long after they have left high school. Additionally, many high schools implement the Kansas Career Clusters Model which provides coursework in a variety of career paths. 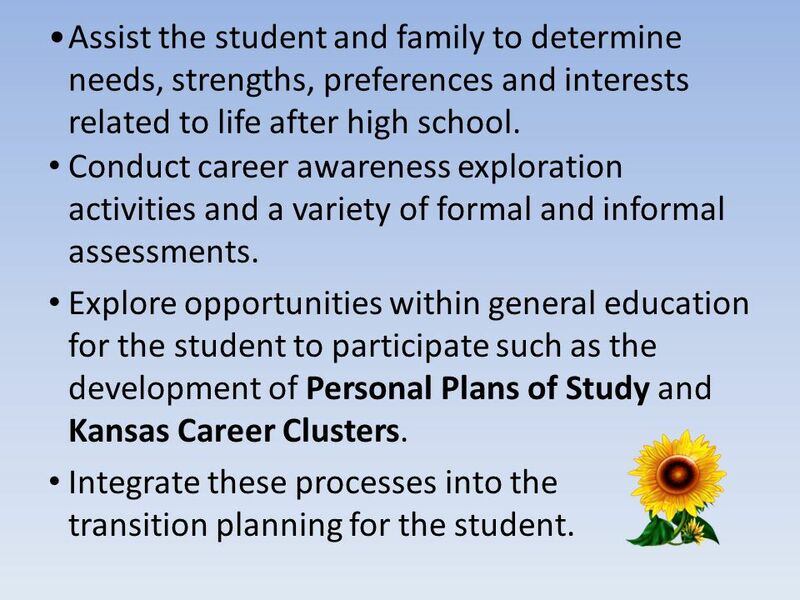 If your school is utilizing the PPS and/or the Kansas Career Clusters, these processes should be integrated into the transition planning for a student with a disability. 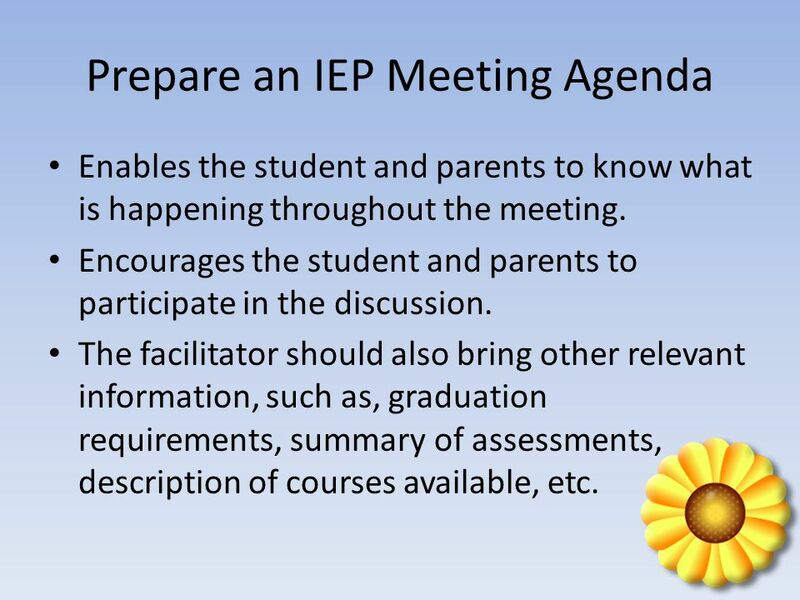 Prepare the student for participating in the IEP meeting. Support the student in developing self-determination skills. There must be documentation that the student was invited even if it is known he/she cannot attend. Prepare the student for participation in the IEP meeting. Discuss the purpose of the IEP with the student. Work with the student to explore different ways the student can participate in the IEP meeting. Student participation can range from conducting an interview with the student, if he/she will not be attending the meeting, to having the student leading/facilitating the meeting. It is important to begin early to assist the student in developing self-determination skills. The student needs to understand how his/her exceptionality affects the ability to achieve desired post-school outcomes, and should be able to describe the combination of supports that are needed to assist the student in reaching his/her goals. 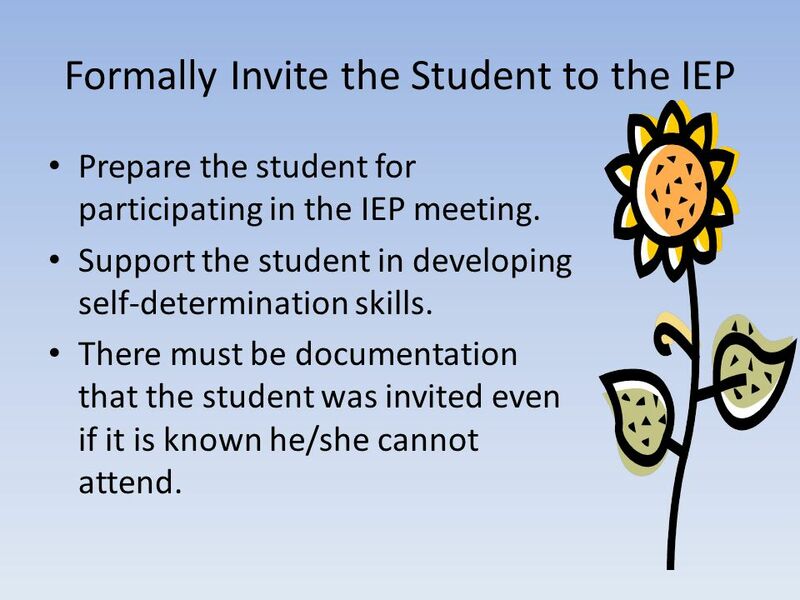 Active student participation in the IEP meeting is an excellent opportunity for the student to practice self-determination skills. If the student does not attend the IEP meeting, use other means to ensure the student’s needs, strengths, interests and preferences are considered. There must be documentation that the student was invited even if it is known the student will be unable to attend. 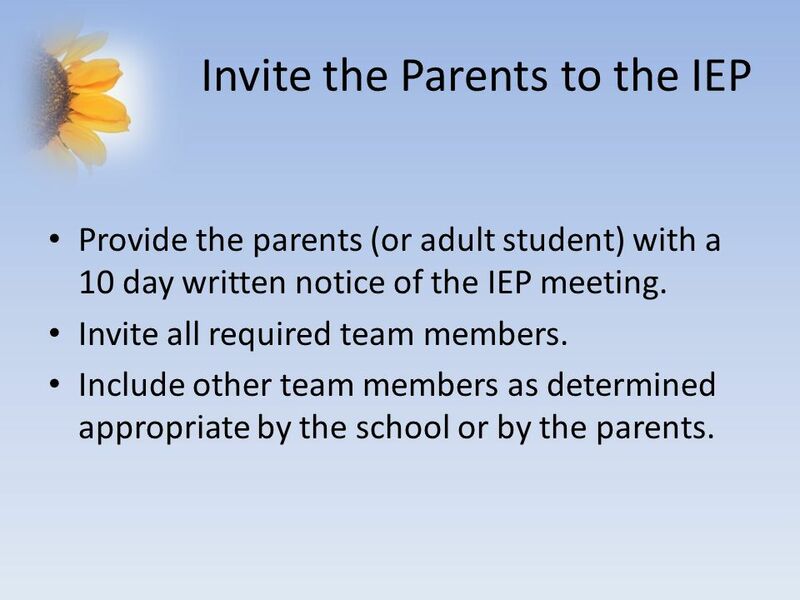 Provide the parents (or adult student) with a 10 day written notice of the IEP meeting. Invite all required team members. Include other team members as determined appropriate by the school or by the parents. 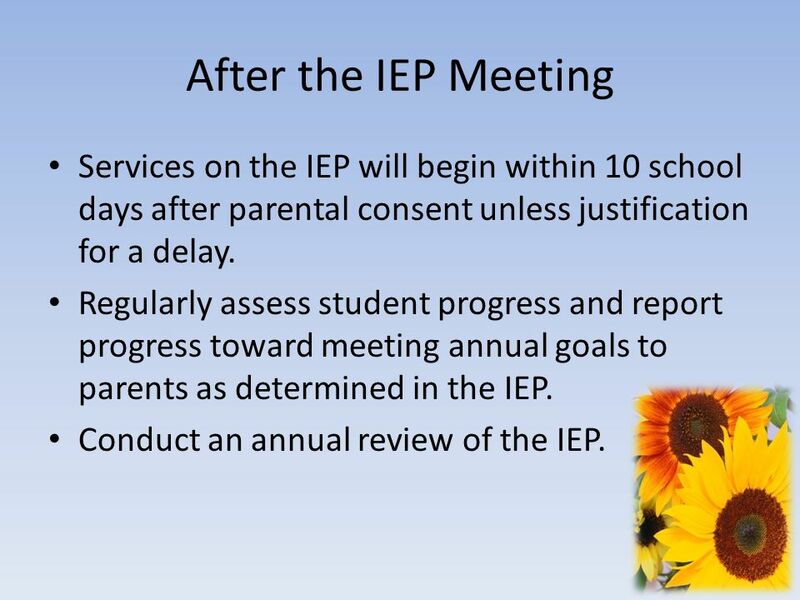 For any IEP that will be in effect beginning when the student turns 14, the parents, or adult student, are to be provided a written 10 calendar day notice of the IEP team meeting which: Indicates that a purpose of the meeting is to consider postsecondary goals and transition services; Indicates that the student is invited to the IEP meeting; and Identifies any other agency invited to send a representative to the IEP meeting (with parent consent). The required members of the team include: the parent(s) of the student at least one regular education teacher of the student at least one special education teacher of the student a representative of the school who is qualified to provide or supervise special education services is knowledgeable about the general education curriculum is knowledgeable about the availability of resources an individual who can interpret the instructional implications of evaluation results the student, if a purpose of the meeting will be the consideration of the postsecondary goals for the student and the transition services needed to assist the student in reaching those goals. You can access a sample IEP Meeting form on the KSDE website. With the consent of the parent invite a representative of a participating agency that is likely to provide or pay for transition services. Use other means to enable the participation of the representative if they are unable to attend the meeting (conf. call, etc). If other agency fails to provide transition services on the IEP, reconvene the IEP team to identify alternative strategies. The IEP team will consider for the current IEP whether this student needs to be linked to post school services, supports, or programs in order to successfully achieve his/her measurable postsecondary goals. To make this determination the IEP team will review the measurable postsecondary goals, present levels of academic achievement and functional performance, the student’s needs, strengths, preferences, and interests. 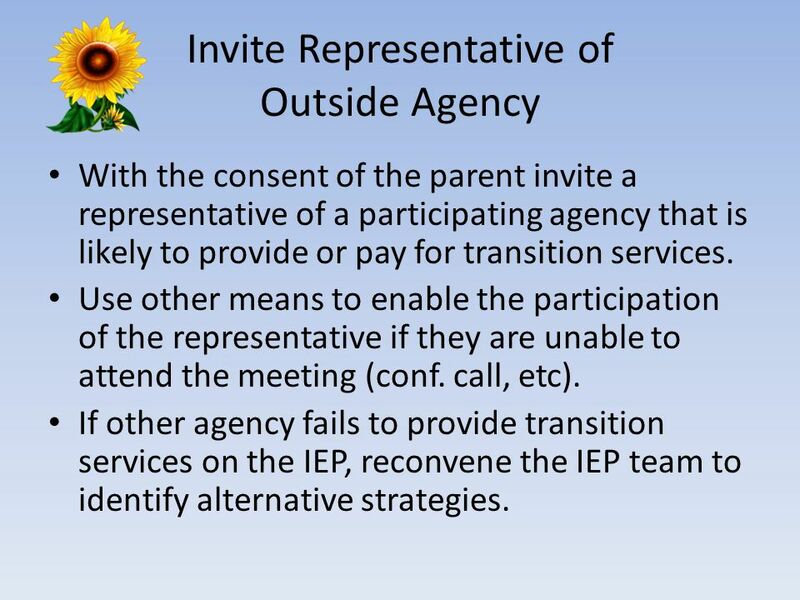 Due to confidentiality requirements, consent must be provided before inviting a representative of an outside agency to attend the IEP meeting. A sample form for obtaining consent is available on the KSDE website. If a participating agency responsible for providing or paying for transition services fails to provide the transition services described in the IEP, the school must reconvene the IEP team to identify alternative strategies to meet the transition objectives set out in the IEP. Enables the student and parents to know what is happening throughout the meeting. Encourages the student and parents to participate in the discussion. The facilitator should also bring other relevant information, such as, graduation requirements, summary of assessments, description of courses available, etc. A sample IEP Meeting Agenda is available on the KSDE website. Beginning with the first IEP to be in effect when the student is age 14. Based on age-appropriate transition assessments in the areas of education/training, employment, and, if appropriate, independent living skills. Must have a goal for education/training, and employment. Only if appropriate, a goal for independent living skills. The postsecondary goals provide the context for all the planning that occurs during the development of the student’s IEP and must be in place by the time the student is 14 years old, and reviewed annually. The appropriate measurable postsecondary goals are based upon age-appropriate transition assessments and reflect the student’s needs, strengths, preferences, and interests—what he or she wants to do. Every student must have an education/training goal and an employment goal. The only goal area that is not always required, due to individual student needs, is the area of independent living skills. The education/training and employment goals may be written as a combination goal that includes each area. 11 Example Measurable postsecondary goals are outcomes that occur after the student has left high school. What a student will do. Education/Training: After graduation, James will attend Kaw Valley’s Technical Institute’s 2 Year Diesel course. Employment: After graduation from Kaw Valley Technical Institute (KVTI), James will be employed as a Diesel Mechanic. 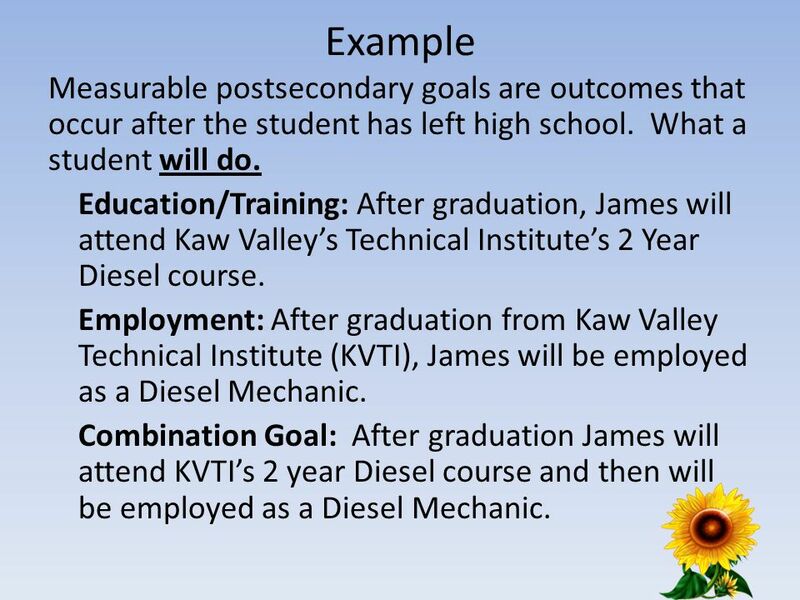 Combination Goal: After graduation James will attend KVTI’s 2 year Diesel course and then will be employed as a Diesel Mechanic. Postsecondary goals should be written in results-oriented terms such as “enroll in”, “work”, “live independently” and use descriptors such as “full time” and “part-time” for clarification Terms like “wishes”, “wants”, “plans”, and “desires” do not meet the requirement for measurable. Measurable postsecondary goals are outcomes that occur after the student has left high school. What a student WILL do (enroll in, attend, work) There are more examples on your handout. Focus on the student’s strengths, needs, interests and preferences in relationship to his/her postsecondary goals. Frame PLAAFPs around the areas of transition services: instruction, related services, community experiences, employment, adult living objectives, daily living skills and functional vocational evaluation. The development of PLAAFPs are framed around the areas of consideration for transition: instruction, related services, community experiences, employment, or other post-school adult living objectives, daily living skills (when appropriate) and functional vocational evaluation (when appropriate). The PLAAFPs for each area should address where the student is functioning in relation to the student’s postsecondary goal; and the student’s strengths as well as relevant deficits or weaknesses. 13 Courses of Study (Age 14) Courses of study are a multi-year description of coursework to achieve the student’s desired postsecondary goals. The courses of study must identify the specific graduation requirements and elective courses. Other educational experiences: work study, community-based instruction, self-advocacy skills. May change from year to year based on student’s needs, strengths, preferences, interests and measurable postsecondary goals. Courses of study are defined as a multi-year description of coursework to achieve the student’s desired postsecondary goals, from the student’s current year to anticipated exit year. The courses of study should be identified on the student’s IEP as a list of courses to be taken each year rather than a statement of instructional program. This would include required courses for graduation (or completion of program) and specific elective courses that focus on improving the student’s academic and functional achievement and to assist the student in reaching his/her postsecondary goals. The IEP should contain the courses for the current IEP year, and minimally at least one additional year. Ideally, the IEP would contain the proposed coursework until graduation or completion of program. The courses of study are reviewed, and if necessary, revised annually. Each year the IEP team, including the student, reconsiders the student’s postsecondary goals and aligns the courses of study with those desired goals. The decisions regarding the courses of study should relate directly to where the student is currently performing and what he or she wants to do after graduation. The IEP team may take the following steps: i. Explore the Career Clusters programs available in the high school that might be appropriate for the student. ii. Review elective courses available and identify courses of study based on student’s needs, taking into account strengths, preferences and interests which support the goals. iii. Consider other educational experiences: work study, community-based instruction, independent living, and self-determination. iv. Consider whether any prioritization is necessary. 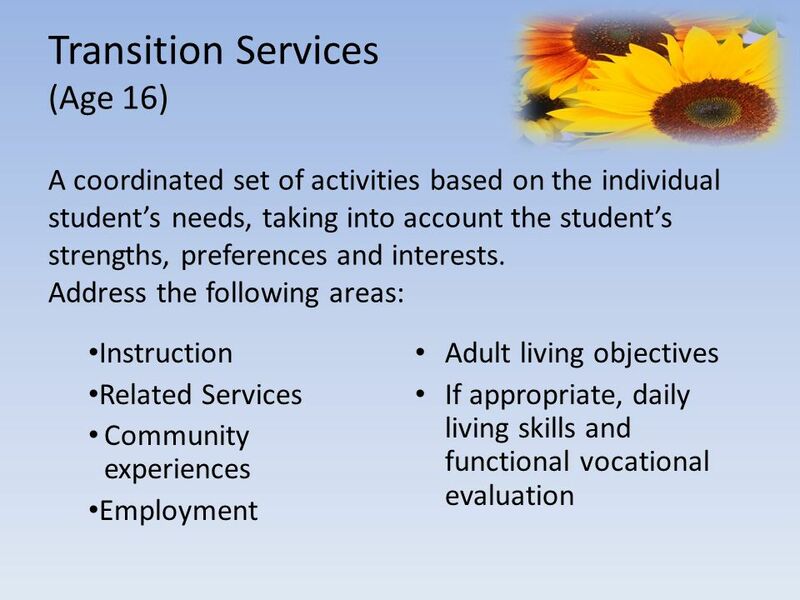 14 Transition Services (Age 16) A coordinated set of activities based on the individual student’s needs, taking into account the student’s strengths, preferences and interests. Address the following areas: Instruction Related Services Community experiences Employment Adult living objectives If appropriate, daily living skills and functional vocational evaluation Transition services means a coordinated set of activities for a student with disabilities, designed within a results-oriented process, that is focused on improving the academic and functional achievement of the student with a disability to facilitate the student’s movement from school to post-school activities. This coordinated set of activities is a broad accounting of what will happen, when it will occur, who is involved and who is responsible. The coordinated set of activities shall be based on the individual student’s needs, taking into account the student’s strengths, preferences and interests, and shall include the following: instruction; related services; community experiences; the development of employment and/or other post-school adult living objectives; acquisition of daily living skills (if appropriate) and a functional vocational evaluation (if appropriate). The IEP team will build from the PLAAFPs that describe where the student is currently performing in relationship to his postsecondary goal. Based on what the student currently needs: What services, supports or programs will this student need in order to achieve his or her desired postsecondary goals and lead to success as the student leaves high school? Are linkages being made to the needed post-school services, supports or programs before the student leaves the school setting? 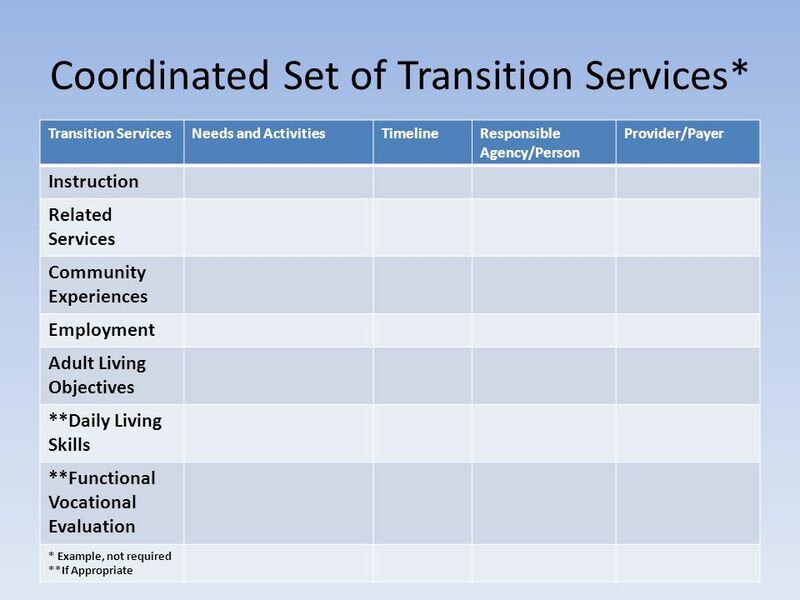 Does the statement of needed transition services include strategies to ensure students and parents are aware of, and connected to, needed post-school services, programs and supports before the student exits the school system? Needs and Activities Timeline Responsible Agency/Person Provider/Payer Instruction Related Services Community Experiences Employment Adult Living Objectives **Daily Living Skills **Functional Vocational Evaluation * Example, not required **If Appropriate This example incorporates all of the requirements for a coordinated set of activities to support the student to meet his/her post-school goals. This format is not required. Include academic and functional goals designed to meet the student’s needs to enable the student to be involved in and make progress in the general education curriculum. Address each of the student’s other educational needs that result from the student’s disability. Must support the student to meet his/her postsecondary goals. 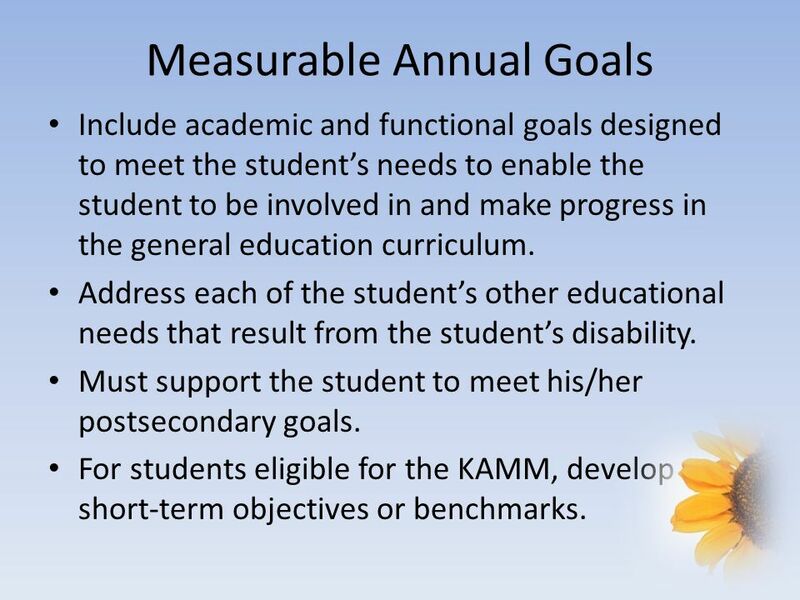 For students eligible for the KAMM, develop short-term objectives or benchmarks. The measurable annual goals must support the student to meet his/her postsecondary goals. For students beginning at age 14, measureable annual goals should be framed or considered in the context of the student’s postsecondary goals. The goals should be based on the identified needs in the present levels of academic achievement and functional performance (PLAAFP). Based on peer-reviewed research to the extent practicable. 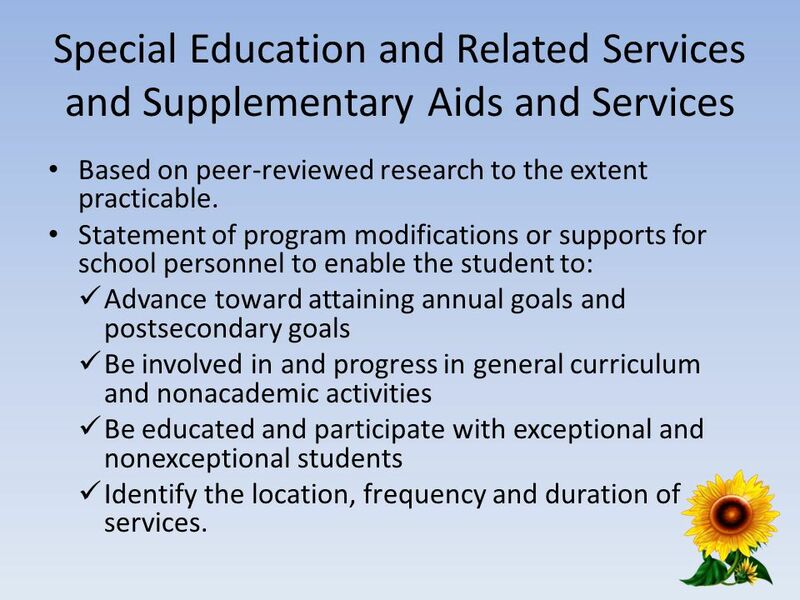 Statement of program modifications or supports for school personnel to enable the student to: Advance toward attaining annual goals and postsecondary goals Be involved in and progress in general curriculum and nonacademic activities Be educated and participate with exceptional and nonexceptional students Identify the location, frequency and duration of services. The team must determine what services and supports will be needed so that the student is most likely to achieve the IEP goals the team has set. The team must determine what services will be provided (special education, related services, and supplemental aids and services), where the services will be provided (general education, vocational education, community, etc), and the frequency (hours/day, days/week) and duration (beginning and ending dates) of these services. At least one year before a student reaches 18 years of age, the student’s IEP includes a statement that the student has been informed of rights that will transfer to the student upon reaching age 18. 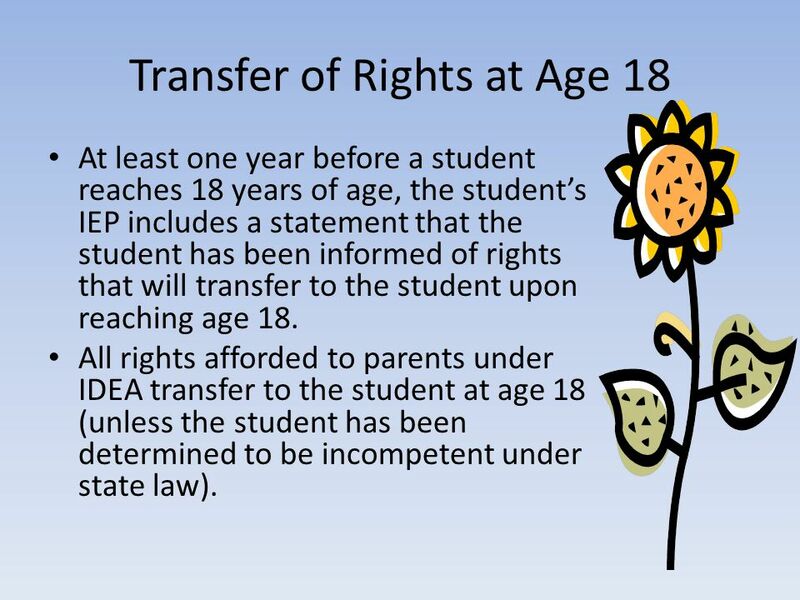 All rights afforded to parents under IDEA transfer to the student at age 18 (unless the student has been determined to be incompetent under state law). When a student with a disability reaches the age of 18 (unless the student has been determined to be incompetent under state law): (a) the student and the parents will be provided any notice required; (b) all other rights afforded to parents under this act transfer to the student; (c) the school shall notify the student and the parents of the transfer of rights; and (d) all rights accorded to parents under this act transfer to the person if incarcerated in an adult or juvenile federal, state or local correctional institution. 19 After the IEP Meeting Services on the IEP will begin within 10 school days after parental consent unless justification for a delay. Regularly assess student progress and report progress toward meeting annual goals to parents as determined in the IEP. Conduct an annual review of the IEP. Provide the instruction, experiences, supports and services outlined in the IEP, assisting the student and family by linking them to any needed post-school adult services, supports or programs. Reconvene the IEP team to plan alternative strategies if the transition services are not provided as planned, or if the student is not making the anticipated progress. Follow up activities should provide sufficient information to determine if the plan is “on track”, or if it is necessary to reconvene the IEP team to address areas where progress is not being made or is not in alignment with the student’s postsecondary goals. At least annually, the IEP team will review the IEP to determine whether the annual goals are being achieved and revise the IEP, as appropriate. The student’s measurable postsecondary goal may change which would impact the courses of study, transition services, annual goals and services. For students whose eligibility ends due to graduation or exceeding the age of eligibility. Summary of academic achievement and functional performance, including recommendations The Summary of Performance (SOP) is intended to assist the student in transition from high school to higher education, training and/or employment and successful independent living. The development of the SOP can start as early as possible. It can take the form of a Portfolio or a form of minimum requirements. 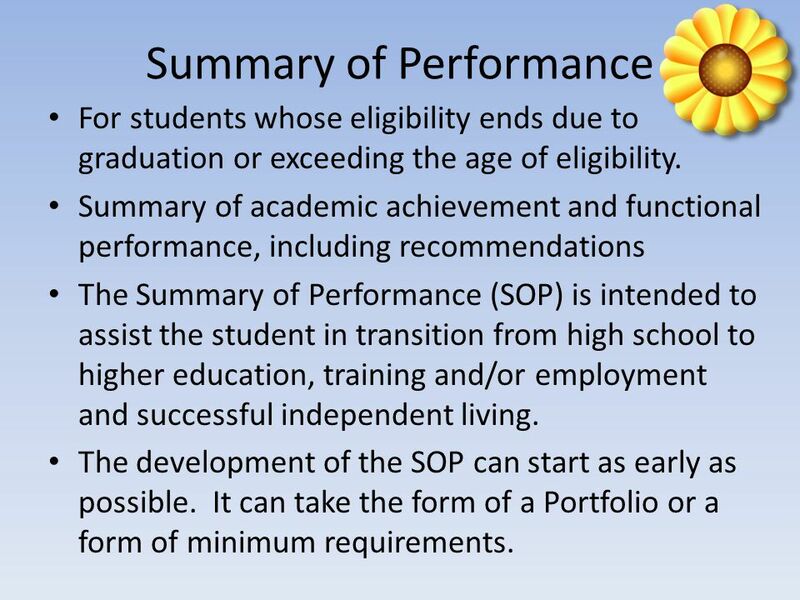 The Summary of Performance (SOP) is intended to assist the student in transition from high school to higher education, training and/or employment and successful independent living. This information is helpful under Section 504 of the Rehabilitation Act and the Americans with Disabilities Act (ADA) in establishing a student’s eligibility for reasonable accommodations and supports in postsecondary settings. The SOP may be completed during the final year of a student’s high school education. That does not mean that it cannot begin sooner. The use of other methods for completing a SOP is encouraged, such as a portfolio. The portfolio begins early in the student’s high school years and compiles information and data to document the student’s learning experiences, skills, and knowledge. Examples of a Summary of Performance are on the KSDE website. Percent of youth with IEPs aged 16 and above with an IEP that includes appropriate measurable postsecondary goals that are annually updated (as appropriate) and based upon an age appropriate transition assessment transition services, including courses of study, that will reasonably enable the student to meet those postsecondary goals annual IEP goals related to the student’s transition services needs evidence that the student was invited to the IEP Team meeting where transition services are to be discussed evidence that, if appropriate, a representative of any participating agency was invited to the IEP Team meeting with the prior consent of the parent or student who has reached the age of majority. (20 U.S.C. 1416(a)(3)(B)) This is the newly revised I-13 requirements. 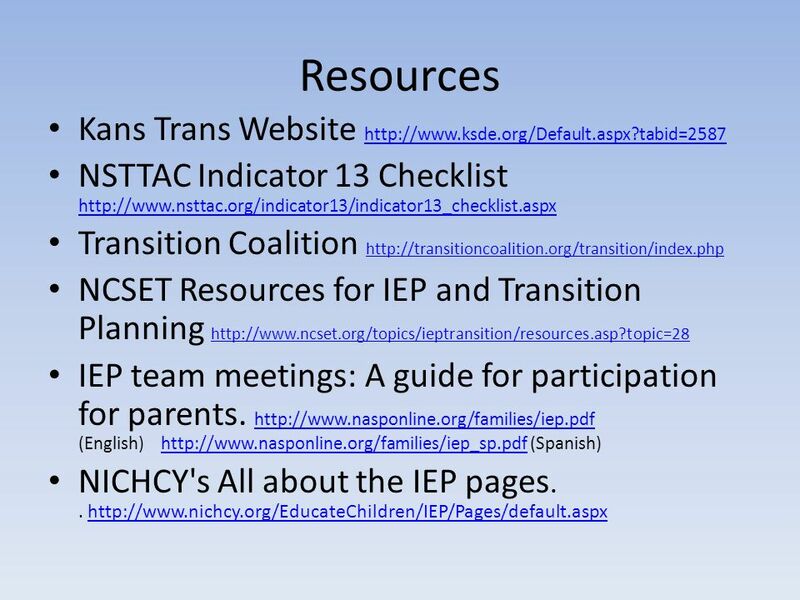 22 Resources Kans Trans Website NSTTAC Indicator 13 Checklist Transition Coalition NCSET Resources for IEP and Transition Planning IEP team meetings: A guide for participation for parents. (English) (Spanish) NICHCY's All about the IEP pages. . There are additional resources listed in your handout. Download ppt "IEP Planning Process Beginning at age 14 the IEP should be focused on meeting the student’s postsecondary goals. The IEP is a plan for preparing the student." August 6, 2009 Using the Indicator 13 Checklist to Support Accurate Data Entry, Engage Staff Development, and Improve Transition Planning Results Presented. MACCRAY Special Education Work-Based Learning Program Helping Students Climb the Ladder of Career Success By: Elyse Hagen, LD/DCD Special Education Teacher. DR. JASON M. NARANJO UNIVERSITY OF WASHINGTON-BOTHELL & DR. JOHN R. JOHNSON SAN DIEGO STATE UNIVERSITY PRESENTED TO: CA TRANSITION ALLIANCE & THE SECONDARY. We know what we need to do for students what barriers prevent us from doing it? Transition 2011. Agenda The HS IEP Review HS Curriculum/Supports HS Panel Round Table. 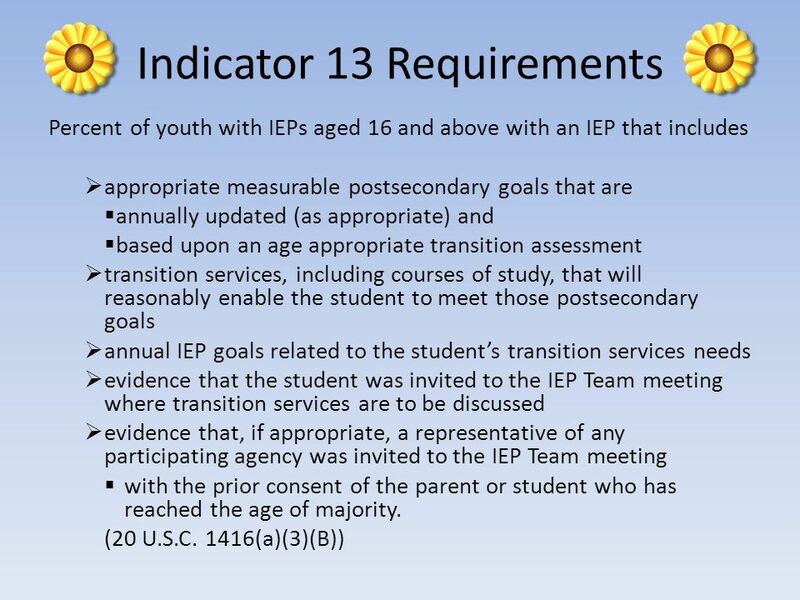 TRANSITION SUMMER INSTITUTE 2014 INDICATOR 13 BASIC REQUIREMENTS. Improving Secondary Transition Services: Meeting the Requirements of Indicator 13 1-Hour Presentation National Secondary Transition Technical Assistance. Transition-Rich IEPs Jennifer Hill, Project Coordinator, Western Michigan University.